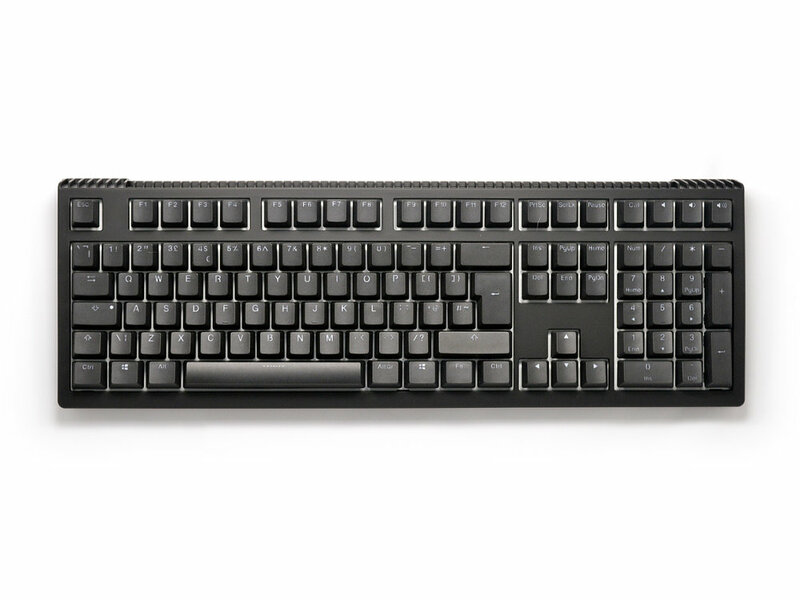 Ducky Shine 6 is a Cherry MX RGB Brown switched mechanical keyboard with full RGB, backlighting and side lighting, hardware and software programable, including dip switches, macro and multi-media functions and a detachable cable. 8 mode RGB backlighting including 100% Full Backlighting, Breathing, Color Cycling, Wave, Rain Drop, Reactive, Ripple and off. You can also program 2 backlighting memory sets to customize individual keys or zones exactly how you want them, with variable speeds. 6 mode RGB side lighting for both sides of the keyboard including Smart mode, 100% Full lighting, 2 Marquee modes, Color cycling and off with variable speeds. Can be installed on the right or left side of the keyboard with adjustable direction, to hold/route your mouse cable. A solid pair of rear rubber legs are installed, they can be reversed or removed to give 3 different rear heights. Ducky uses only genuine Cherry MX switches, with a life cycle for over 50 million actuations. Standard cross-shaped, allow users to replace keycaps easily. Gives a longer life expectancy and improved signal stability. An SMD 3528 RGB LED is rear mounted under every switch to improve the backlight brightness. 8 Fn key positions available, it can be any key from left ctrl to right ctrl except the space bar, and you can have it disabled (no key). Any number of simultaneous key presses, you can use the keyboard confidently in any situations knowing that there will never be ghosting or key blocking issues. You can also switch to standard 6-Key rollover mode. Contents: Black Ducky Shine 6 keyboard, detachable cable and Ducky hook-and-loop reusable cable tie, keypuller, flexible mouse bungee and manual. Great keyboard. The keycap quality is excellent. Every switch press feels reaponsive. Rgb lighting has lots of functions and is easy to use using the function keys. The mouse cable holder is a nice touch and has been useful. The volume of the keyboard is quiet enough for an office which is great. Have dropped a star due to usb connection and cable. The connection is micro usb and is a bit stiff, hopefully usb c will be used in future models as micro usb has never lasted a long time for me. The other down side is that the cable is not braded and feels cheap, shame for such a lovely keyboard. I have swapped the cable for a braided cable and is now asthetically pleasing. All in all a great keyboard and excellent service from the keyboardco, product arrived next day.